Soon after reading about the importance of design in the benefits of an outdoor classroom, including resources from the Nature Explore Program, Conestoga Elementary staff and PTO determined that hiring a professional landscape designer was worth the cost. They partnered with Greenlife Landscapes to follow the design principles that have been researched and developed through Dimensions Educational Research Foundation. Using the natural environment of the school, which is situated between corn fields, the landscape architects created a space that opened up an entirely new and magical world to students at the school. The classroom has a wonderful, open and inviting feel. The vision of the outdoor classroom was a compilation of ideas from staff, parents and students. Over 40 parents, students, staff and community volunteers helped with the construction of Cougar Hollow. From the delivery of dirt and mulch, building of the stage and bridge to hauling cut logs and tractor tires, volunteers were the key to a successful implementation. In addition to the $26,000 raised through student fundraising efforts, over $17,000 was raised through local business and personal donations as well as diligent grant request writing. The Conestoga High School FFA group partnered with the Elementary in a successful bid for a garden grant. This new garden area will be added in the spring of 2014. Local Boy Scouts fulfilled their conservation requirements by providing a barrier for water runoff and planted additional trees and local Girl Scouts are currently working on a project to install bird feeders in the classroom. This amazing space was developed using the researched based standards and principles of the Nature Explore Program and intended for use during classroom time and recess. When working with the landscape designer, the need for durable and low maintenance plantings, surfaces and materials was specified. 15 trees were planted throughout Cougar Hollow to provide shade and interest in addition to a large quantity of hardy, heat and drought tolerant grasses. A variety of plants, which attract insects and provide color, were also added to the space. Natural cedar mulch defines many areas and creates a walking path that connects all areas of the classroom. The trees and plants were chosen based on their ability to thrive in Nebraska’s climate with little care and although many plants were added during the driest summer in recorded Nebraska history, they are thriving in the classroom. Conestoga’s outdoor classroom is named after their school mascot, the Cougar. Many elements make Cougar Hollow unique to the school and community. A handicap accessible path has been stamped with interesting designs, such as tree leaves and bird and animal tracks. 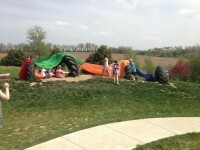 A pyramid of recycled tractor tires in the Sand Area and tractor tires in the Climbing Area invite children to successfully master physical challenges and view the world from multiple perspectives. Each area of the classroom is visible from the Grand Entrance, that is designed to let children and visitors know that they are entering a very special space. Areas are defined both clearly and naturally with unique materials. Tree stumps, cut at an angle were used for signage in each area. A router was used to carve out the names of each of the areas, painted within the router grooves and sealed with a non-toxic sealant. The outdoor classroom is a great space for gathering children and families throughout the year. In October 2012, an Open House Nature Night event, called Cougar Hollow-een, was hosted in the outdoor classroom where students came in costume and listened to spooky tales around the campfire. It was such a hit that the 2nd annual Cougar Hollow-een was held this October. 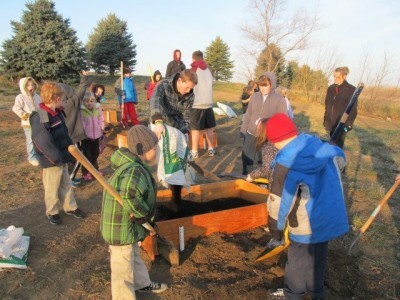 In observance of Earth Day, 2012, the sixth graders planted trees by the Grand Stage and on Arbor Day, 2012, the second graders celebrated by planting fruit trees in the classroom. In August 2013, a mascot was introduced to the classroom, Carlin the Cougar. Carlin introduced a Cougar Hollow Handbook recommended by teachers to instruct students on the care and use of the classroom. Various contests were held in the classroom, including a tree naming contest, a quiz on the new handbook, art contests, and a writing contest. Communication for the outdoor classroom has been very successful through the following: a local newspaper, the Plattsmouth Journal, who dedicated an entire half-page to the Open House event; the local community website the school newsletter; and Facebook pageThe Facebook page is filled with photos and stories highlighting the efforts and success of the dedicated and inspired Conestoga Elementary staff, PTO, and their entire community.